← Major expansion at the Royal B.C. Museum? Detail of entrance of Port des Francais. Source: Brown University. Click for zoom version. The French decided to mount a scientific and exploration voyage to rival that of Captain James Cook. Two ships, the Boussole and the Astrolabe, under La Perouse’s command left France in August 1785. They spent the summer of 1786 off the coasts of Alaska looking for a northwest passage then sailed down the west coast of North America in August and September 1786. One of their most memorable and tragic periods was the time they spent in Lituya Bay, Alaska, which they called Port des Francais (map). Lituya Bay, with Cenotaph Island in the foreground. Source; Panoramio user footsnviews. Their mapping and illustration of Tlingit life are not unknown but also not that easy to find. I recently came across an interesting site which has the best web presentation of these materials (actually reproduced from a 1798 British edition) I have seen: the images are highly zoomable, and the zoom is fast and crisp and smooth. Linking to specific images is possible and the links don’t break. With a little bit of effort, you can download the images (hint: “view source” of the page and search for ‘Size4″). So zoom right in and see the details of pictures such as this one of a fish camp (are those halibut drying, or Pacific cod? ), or this one of both a fine Tlingit dugout, and the construction of a skin vessel, with its seal skin hull removed and placed to one side. The chart made by La Perouse is here and full of detail (again, these are English re-engravings of the originals). 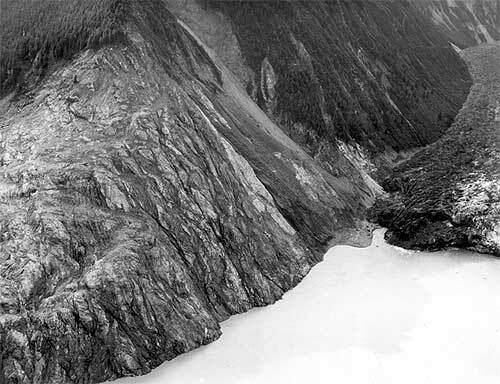 The next day, the narrow entrance to an inlet was located to the east of Cape Fairweather. De Pierrevert, from the Boussole, and Flassan, from the Astrolabe, were dispatched in small boats to investigate the inlet. Their favourable reports encouraged a somewhat reluctant La Pérouse to take the ships in. Their first approach was unsuccessful and they tacked offshore through the night before the tide carried them in the next morning. Even then, it was a precarious passage and the ships both nearly were driven onto rocks. They anchored just inside the entrance but La Pérouse was not happy with this spot, it having a shallow, rocky bottom. He sent men off to a find safer anchorage. D’Escures found a better location behind the large island in the inlet and the two ships transferred there. It was 3 July 1786. Local people watched their arrival and they quickly came out in canoes to begin trading, especially in sea otter skins. A chief came on board to welcome them. An observatory was erected on the island and tents were put up for members of the crew to make repairs. However, thieving of items forced them back on to the ships. The inlet, which La Pérouse named Port des Francais and which is now known as Lituya Bay, is most dramatic and La Pérouse was struck by the majesty of the place. He led a party to explore the head of the bay, which separates into two arms, both of which have glaciers feeding into them. The inlet eats into the coastal mountain range so on all sides it is dwarfed by high snow-capped mountains. The effect of the glaciers was felt when an iceberg was calved and the wave generated sped across the water and capsized one of the longboats. They ventured a little way up one of the glaciers but progress was very slow and dangerous so they gave up and returned to the ships. By the 12th, La Pérouse was ready to leave. Bernizet had charted the inlet but some depth soundings were still required. Three boats set off early on the morning of 13 July to complete the charting. D’Escures was the senior officer of the party and he was in charge of the Boussole’s Biscay boat. La Pérouse was wary of d’Escures’ tempestuousness and went so far as to issue written instructions warning d’Escures not to lead the party close to the inlet’s entrance should the sea be breaking over it. De Marchainville was in charge of the Astrolabe’s Biscay boat while Boutin was in charge of the third boat. They departed at 6.00am and at 10.00am Boutin returned in a distraught state. Despite his instructions, d’Escures had ventured too close to the entrance and his boat had been swamped. De Marchainville had then directed his boat to attempt to rescue the occupants of the first boat but his boat had also been overturned. Boutin had realised that a similar fate would befall them and had pulled back. Search parties were dispatched and scoured both shores of the inlet. However, all 21 occupants of the two Biscay boats were lost and their bodies were never found. Drowning of the Crew at Port des Francais. Click for zoom version. The whole of the expedition was stunned. They remained for another two weeks, hoping to find survivors or at least remains. They also needed to come to terms with the loss and reorganise the duties and structure of the crews. The plans for the next part of the voyage needed revising. A cenotaph was erected on the island and a plaque listed the names of the men lost. The island was named Cenotaph Island. On the positive side, they had produced detailed descriptions of the inlet and its people. A small vocabulary had been compiled and charts drawn. Finally, on 30 July, the two ships sailed out of Port des Francais. It would be harsh to say “they got off easy”, and of course La Perouse’s entire expedition later perished at sea. But, remember how in the extract above, one of their boats was capsized by a wave produced by a calving iceberg? On July 9th, 1958, a landslide in the bay produced the highest wave ever recorded on Earth, with a run-up on land of 524 vertical metres (! ), 100 metres taller than the Empire State Building. Unbelievably, while several people were killed, several others rode this wave out on their fishboat and are interviewed here. Smaller but significant waves have happened in Lituya Bay on five other occasions in recorded history: “The 1853-54 wave was estimated at 395 feet, the 1874 wave at 80 feet, the 1899 wave at 200 feet, the 1936 wave at 490 feet and the 1958 behemoth swept trees off a hillside at more than 1,720 feet.” Here is an awesome animation of the wave, “The Director’s Cut“. Also see the rockslide animation, while this one is great for a sense of scale, and this one shows the splash apparently goes a mile in the air (literally). All these great animations and more (Krakatoa, Cascadia subduction, etc) are from here, which is Dr. Steven Ward’s page at UCSC. This entry was posted in alaska, First Nations, history, Northwest Coast and tagged alaska, exploration, geology, La Perouse, Lituya Bay, megatsunamis, tlingit, tsunamis. Bookmark the permalink. Great blog – now that is erosion in action, at high speed. This must be a bit like the floods from ice dams bursting in the late Pleistocene, such as the one that created the scablands in Washington State. Scoured clean with 30 foot high ripples. As an island resident I sure hope that the mainland mountains stay in place, and the leading edge of the Fraser Delta does not slump, or we could be in serious trouble around the margins of the Salish Sea. More historical information on Lituya Bay: From the Pacific Coast Pilot, Alaska, Part 1, US Coast and Geodetic Survey 1883 (pages 202-205). “Harbor Point forms the eastern point of entrance to a remarkable bay named by the Russians from the name in use by the natives. The bay had been visited by Russian hunting parties before La Perouse, who found the frame of one of their baidars there, (th0ugh he did not recognise the fact,) but to him is due most of our knowledge in regard to it. Since then the bay has been entered by a whale ship commanded by Capt. E.P. Herendeen and by the U.S. Coast Survey Schooner Yukon in 1874. Reads to me as if in 1874 there was evidence, not for flooding from an ice dam across the mouth of the bay, but for waves from avalanches or ice falls into the bay. These old pilots are a wealth of information – there is too much in my copy to type out. 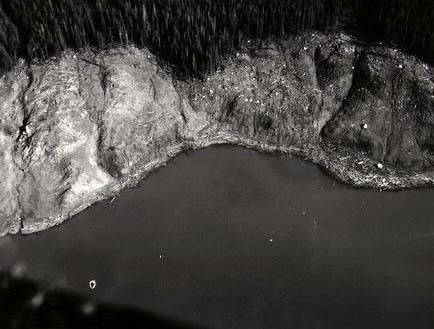 This account (http://www.history.noaa.gov/stories_tales/lituya.html) has some of the information from the pilot, including a view of Lituya Bay drawn in 1874 from offshore (most harbours have such a view in this volume). It also has a summary history of the various expeditions to map/chart Lituya Bay. An interesting feature of this work was the use of a seaplane in transferring equipment from Lituya Bay to Crillon Lake where a base camp was established. The seaplane was again used in transferring 900 pounds of canned food and tents separated into 31 wire-bound packages and dropped from the air into the snow at an elevation of 5600 feet for the establishment of another camp. No parachutes were placed on the packages and although they fell nearly 1000 feet there was very little breakage; only a few tins of vegetables were broken. In this way they accomplished in a single day the work of six men for two weeks which would have been required had the material been packed to this location. You can imagine that Cenotaph wasn’t likely to survive the 1853 395 foot wave let alone the 1958 monster. 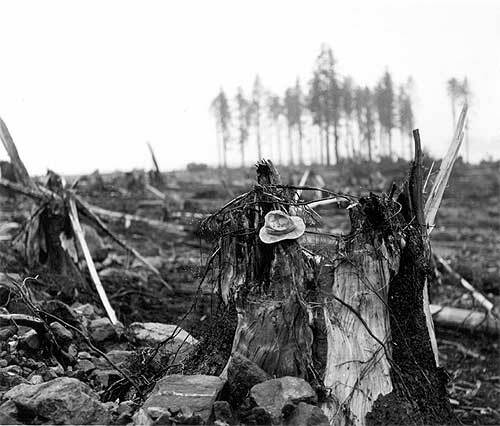 On the panoramio photo above, you can see the cutline on the trees from 1958 pretty clearly. I note the La Perouse map shows three villages near the entrance bar – there must be substantial oral history about that. First place I’d look would be de Laguna’s Under Mount St. Elias. What’s this? A download of that classic 1972 work, you say? Useful to have that De Laguna link. I have a hard copy but long after I bought it I found it was missing one of the sections; naturally the section had to do with tools and other things that would be found in a site and of most interest to me. Welcome readers from the excellent bibliodyssey blog, which made kind mention of this posting recently in the course of a comprehensive, well-illustrated post on images from the voyage of La Perouse. Great details! Is there any chance you could help me learn what the tides must have been like when La Perouse visited the bay in July 1786? I’m a graduate student writing a paper on that fateful visit.